Think that faecal sludge isn’t relevant to you? Think again! 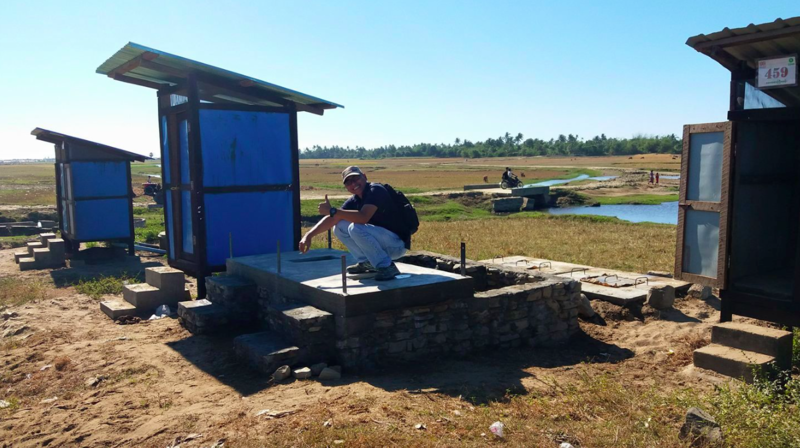 HIF has a portfolio of seven faecal sludge management (FSM) projects, and during a stock check on what they’ve learned about innovation, it was clear that the top three conclusions apply to more than just emergency WASH: they’re about the humanitarian ecosystem. We all get excited about the prospect of finding the new vaccines for deadly diseases or a pill to cure malnutrition. However, most innovations aren’t meant as silver bullets, but rather as slightly better solutions to problems in specific contexts—and a big part of the innovation process is working out what those contexts are. Three components are central to whether a faecal sludge innovation will be applicable in these contexts: user acceptance, availability of local resources and supply chain (and therefore cost). Oxfam’s Tiger Worm toilets are an example of this. The team have (perhaps surprisingly) found that acceptance often isn’t a problem—people are more fascinated than disgusted by sludge-eating worms in their toilet. However, the fact that the wriggly sludge sanitizers need water to do their job limits the applicability of the worm toilet to emergencies where enough water is available. The project team is also considering the impact of worm supply chains on where it’s feasible to have the toilets, and how quickly new toilets could be built (or old ones retrofitted) and filled with worms. This will determine whether vermifiltration is a promising solution for rapid-onset emergencies or only applicable to more stable settings. Running a successful early stage innovation project is no guarantee of wider impact. 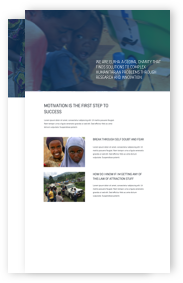 Many organisations suffer from ‘not invented here’ syndrome (described well in this blog), and individuals or organisations with new products or ways of doing things find it hard to get humanitarian organisations to adopt these if they aren’t developed in-house. 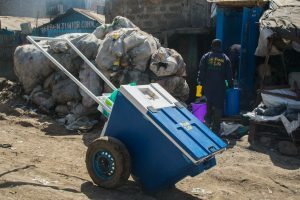 WASTE found that, while they have tested an effective way to rapidly sanitise and stabilise faecal sludge using chemical additives, this method has not yet been implemented by any aid agencies. Similarly, the entry barriers for non-humanitarian organisations to test an innovation for the humanitarian sector are many. Regulation and operating procedures are necessary to ensure that activities in humanitarian settings are ethically responsible, but this needs to be balanced against the potential of innovation projects to make significant improvements in the lives of disaster affected communities. 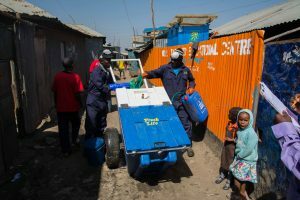 In a project with GOAL, social enterprise Sanergy recently developed a mobile waste transfer station which, Sanergy believes, has high potential for supporting more effective emergency WASH. However, to develop this product into a feasible solution for emergencies, they must first test it in a rapid-onset emergency rather than more stable, urban camp settings. This has been a significant challenge for Sanergy, as no humanitarian agencies have been willing to provide field access and develop a protocol for implementing Sanergy’s model in emergencies. Even if you are a humanitarian organisation, it can be challenging to get your innovation from pilot stage to a place where it’s feasible to implement in emergencies. Here, it’s an advantage if you can learn from other contexts where similar approaches or products are being used. One of Oxfam’s problems with the worm toilet is that very few locations have worm production at a scale large enough to supply the volume needed for these toilets to be sourced right after an emergency event. 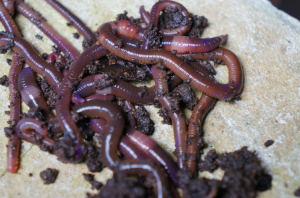 The project team are therefore looking at ways to rapidly build local ‘worm supply chains’, and found that the worms’ use in household composting could be key. People may not be willing to pay for going to the (worm) toilet, but if composting is an integrated part of their livelihood, and worms are useful for this, there is a potential business model for both building a worm supply chain and subsidising worms for the toilets. Similarly, Sanergy has found that the feasibility of their model of turning human waste into fertiliser is reliant on them having an understanding not just of faecal sludge management, but very much also of the fertiliser market and how to sell to these customers. Innovating requires focus and technical detail. But as these examples demonstrate, one of the biggest risks when innovating is that good findings or solutions are rarely used at the full scale of their potential. The only way to guard against this is to put the system in which the solution is plugging a gap at the front and centre of your planning. At the HIF, we are always exploring what our funded projects can teach us about this and how we can support teams to build this into their innovation management. One tool we find helpful for this aspect of innovation management is the Business Model Canvass—you can find a free version of the tool here. Blog by Cecilie Hestbaek, HIF Innovation Management Adviser.